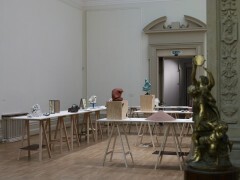 Nottingham Castle Museum & Art Gallery and Christina Mackie won the Contemporary Art Society's annual Commission to Collect award in 2011, and an exhibition of the work has just opened. We talk to the artist about the process of making a piece for the museum's permanent collection. 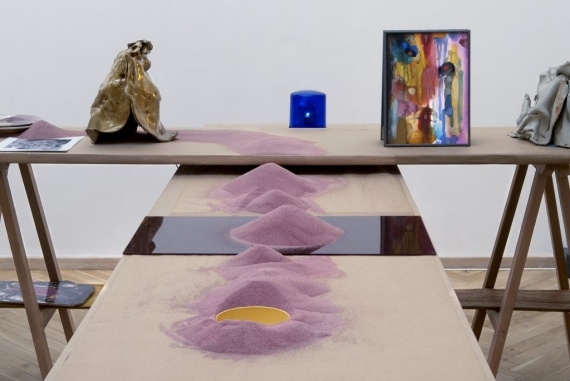 Described by Deborah Dean as a “thought process made visible”, Mackie’s work can forge seamless alliances between methods sometimes thought to be mutually exclusive. Her ceramic objects and vivid abstract paintings, made using natural dyes and glazes that refer to Haida and North West Coast Indian art, imply an interest in craft and folklore, even as her digital pieces play with ideas of virtual reality and physical presence, all within a highly conceptual frame. This is why the alignments within The Judges III seem so important, as Mackie draws material from the Castle’s collections, its geological location and its long history as a public art gallery, into the field of the work. “The kind of collection put together in the Victorian era was usually about making a statement that we could know everything,” she says, “but this piece is a meditation on the objects themselves. I’m not interested in showing what I know because I don’t believe in that kind of knowing. 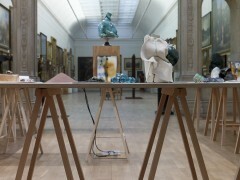 The Judges III is on show at Nottingham Castle Museum & Art Gallery until 27 April 2013. 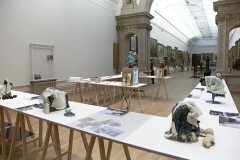 The Contemporary Art Society is currently calling for submissions to its Annual Award for Museums – Commission to Collect 2013. Deadline for submissions is Friday 21 June 2013 at 5pm. For full details on applying see www.contemporaryartsociety.org.